Mantank Environmental Services Ltd provide industrial clean up services, in which we are faced with a variety of materials including dry and dusty particles and sludge and slit-type products. We have years of experience in working on these project types, however something that we are often asked about by our clients are the pieces of equipment that we use. As with all our services, our kit is at the very core of what we do and so, our team have tried and tested a variety of industrial vacuum units before selecting our current supplier. We understand that our equipment plays a vital role in the end result of a project and therefore we only work with organisations that produce machinery that we know our team can rely on. In terms of industrial vacuum units there are a variety of options on the market however we have specially selected our chosen brand based on quality, reliability and maintainability. We work with clients throughout the UK, providing our industrial vacuum services on a variety of project types. 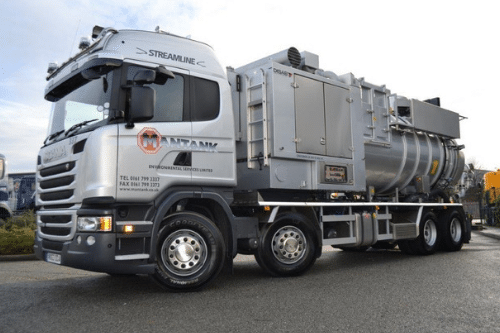 From waste water removal to dewatering and sludge and slit removal – our team utilise our high specification industrial vacuum units to ensure the end result exceeds expectations. At Mantank we have invested heavily in our industrial kit, as we understand the importance that our equipment is in terms of the service we offer to our clients. As with all our machinery, we try and test the options on the market before making a decision. However, for our industrial vacuum units – there was no competition. Our team work with DISAB Vacuumation Units for the removal of dry materials such as cement, sand, gravel and many more dusty materials. Industrial vacuum units can be utilised in a variety of different situations including vessels, hoppers, pits, silos and loose on the ground. Our DISAB Vacuumation Units also lift heavy sludge and mixed waste types. We operate our liquid ring tankers for these projects, which ensure that all material is removed quickly and efficiently. As the DISAB machinery covers a huge variety of waste requirements, we are able to provide outstanding services to our clients across a range of project types. So, whatever your requirements our team will be here to help. If you are looking for a reliable industrial cleaning company that can assist on products where both dry and wet materials need to be removed – look no further than Mantank. Our team have years of experience in working on industrial vacuum projects, making us one of the leading providers of these services in the UK. To find out more about our industrial vacuum units and the services we provide, do not hesitate to get in touch with our team. We work with clients throughout the UK, offering high quality and cost-effective environmental and drainage services. To speak to a member of our team simply fill in our contact form and we will be in touch as soon as possible.